Once in a while TLC Books contacts me about reviewing a book because they know I enjoy anything focused on neuropsychology. When I was an undergrad at Baylor, my favorite class was neuroscience, and when I was working on my masters degree I focused on neuropsychology classes, and did my thesis in that area as well. I love to keep up with new trends in the field, and appreciate the opportunity to read new books that come out. 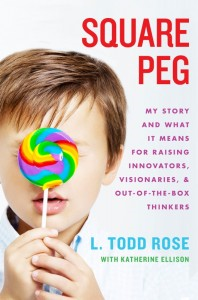 Square Peg - My Story and What It Means for Raising Innovators, Visionaries and Out-of-the-Box Thinkers, by L. Todd Rose, is one such book. However, don't be scared if just the term neuropsychology intimidates you - this book is written to appeal to the average reader. The book is partially memoir - Todd Rose was the type of kid that struggled immensely in school. He acted out so much that he was often suspended, and his mother lost friends because of his behavior. Eventually, his lack of impulse control and overall frustration resulted in him dropping out of school. Todd Rose was diagnosed with ADHD, and he feels like in some ways the education system failed him. Part of the purpose of Rose's book is to make suggestions of ways the system needs to change to better accomodate all styles of learning. Rose backs up his suggestions with a wide variety of statistics and scientific studies, which I found fascinating. He explains these studies in simple terms, that the average reader will have no difficulty in comprehending. In addition, at the end of each chaper he summarizes with 'Big Ideas' that have been covered, along with 'Action Items' - things you can do to help make positive changes in the life of someone you know who might be struggling in school or at home. By far, my favorite section of the book was towards the end, when Rose writes of changes in technology that may help future students with learning differences to be more successful. The potential for positive change is impressive, and while there may be a balancing act along the way (to make sure that schools don't overuse technology in lieu of student/teacher interactions and group work), it warmed my heart to know that years from now there may not be as many troubled and frustrated students in school. In case you're wondering, the story also has a happy ending for Todd Rose. Against the odds, he today he is a faculty member at the Harvard Graduate School of Education, where he teaches educational neuroscience. I love stories like this that have happy endings -- it gives hope to others experiencing the same thing. I have always thought that I would have been labeled ADHD if the term had existed in the '50's. I could never sit still or pay attention in school. I still can't. Would love to read that book! Bet your little brother would also. If he had time to read. Lisa this sounds like a very interesting book. My poor Mom had a bunch of us outside the box thinkers and could have used this book. Great review Lisa!! I am sure I was an outside the box thinker but years ago, who knew!! I have an out of the box thinker. This sounds like a wonderful book. I'm not sure it's quite my thing, but I really, really love memoirs so it could be. I do like the idea that his discoveries could potentially help make the difference for those who follow. If only this book had been around when I was raising my boy who appears to have the same struggles. I can relate to losing friends over his behavior, too! Glad there's a happy ending. This sounds like a book I'd benefit from reading! Sounds like a neat book ! Hope your day is great ! Sounds like an interesting book. I always felt like a square peg, even though I did well in school. I'm glad good things happened for this author. Just a note: a while back you recommended a book to me, Quiet, by Susan Cain. I finally read it and enjoyed it so much. It was really eye-opening in the way our society revers the Extrovert Ideal. The accomadations we perhaps made to learn can be expanded to accomadate other learners. I often wonder what tag I may have been given had they been there. I laughed once with a parent telling me her daughter might be a slower learner with adhd, since she didn't realize my entire classroom was. In trying to make all kids alike---they try to lump kids all in the same school rooms --and expect a teacher to teach 25 of them, even though they are all different and at different levels.. Just not possible. Don't know the answer --but much of it goes back to the home life I think... Just my opinion --without knowing much about the situation. How interesting! I'm glad the story had a happy ending. A few years ago my husband took a class on special education towards his masters in administration. I watched some of the videos along with him and saw some fascinating things about educating different types of learners. adhd, autistic, developmentally challenged. A lot has been done, but not nearly enough. Glad you enjoyed the book. This book sounds so interesting! Thank you so much for being on the tour. Seems from the comments that your readers really enjoyed hearing about Square Peg. Thanks again! Sounds very interesting. I need to check it out. What a great outcome! Looks like a book I should read. Sounds like a great book! I only minored in psychology, but in retrospect it should have been my major, it's where my interest was. Thanks for sharing! I can totally relate to Todd's book as my own son is quite and out of the box thinker and has ADHD and has had much trouble with school. As a parent and teacher, it has been a real struggle. However, as he grows/matures he is coming into his own incredibly unique person. Nice to see that books like this show that being different is actually an important quality. It's so important for educators to realize that there are many different styles of leaning. I've seen that with Amy and her friends and classmates. This sounds like a fascinating book, and I'm glad for the happy ending too. We like happy books. Oh and we wondered if you got to feeling better. It sounds like a book I would love! This is amazing and hopeful! There are so many interesting books in this world..
Wow, that sounds like such a fascinating book! Especially now that Shaune is working in the school system he sees this type of thing all too often. My heart aches for the misunderstood kids. Sounds like a great read.